It’s not often a media publication has a pot of money sitting idly in the corner, waiting to be spent on marketing. But that’s exactly the case at The Guardian Australia office. So how much will they invest in above the line marketing for the launch of the new website? Managing director of The Guardian Australia, Ian McClelland, says minimal. It’s the same route they’ve been taking since launching Down Under about 18 months ago. “We’ve got this pot of money ready for our brand campaign and we’ve just had such unprecedented and exponential growth over the last 18 months,” says McClelland. Someone said to me the other day ‘what’s your marketing strategy?’ I said: ‘hire brilliant journalists’. It’s the best marketing strategy you can have. “Every month I talk to the senior management team and say ‘should we spend any money on marketing?’ It’s been the amazing journalism and great articles that have driven growth. Good SEO and good social integration too, but it’s really about really powerful journalism. While the marketing budget side remains silent, The Guardian’s team has been working non-stop to get the new site up to scratch as well as securing Hyundai as a commercial launch partner to show off the new ad formats. The new site has been in beta testing mode for the past 10 months with 5% of The Guardian’s audience able to view the test site and provide feedback. More than 40,000 pieces of feedback were received during the phase, and eventuated into one area of thinking behind the new site, the death of the homepage as we know it. Director of digital strategy for The Guardian, Wolfgang Blau, says: “The whole idea of a homepage is broken really if you look at what’s out there.” Referencing news sites around the world, he says typically the publications use a form of ‘zoning’ where the layout is similar to a newspaper, for example business, finance, culture then sport. “It’s basically reflecting the internal organisation of a news room but not how you would consume,” he says. As most of the site’s audience come to articles through channels such as social media, other websites or image galleries, Blau said they needed to start thinking about how every page could operate like a homepage. The old webpage looked like a newspaper with vertical columns. “It has the advantage that you can get the news journalism and the non-news journalism both into the first screen. The disadvantage is all the hierarchy you can assign to news is this vertical column. It all has the same importance and is in a chronological list,” says Blau. Each of the containers such as the sport, highlights and headline ones shown above can be moved around, giving an easy way to assign importance to stories, instead of just throwing a list at a reader. “That’s one strong reason that we had to do this, to become a proper breaking news site without hiding the enormous other strengths The Guardian has,” says Blau. You can’t relaunch anything technical these days without thinking about mobile, and with 53% of The Guardian’s traffic coming from mobile devices McClelland says they had to “future-proof” the site. Colour plays a big part in the new site, with creative director Alex Breuer explaining why the team colour coded different types of stories. In terms of commercial options, one growing trend The Guardian is keeping in mind for the future is time based ad metrics, where advertisers buy ad space in relation to how long it will be shown for. Over in the States, media publication Adage found that 80% of publishers want to sell ads based on time. As of right now, the new format allows different ad spots to be available. 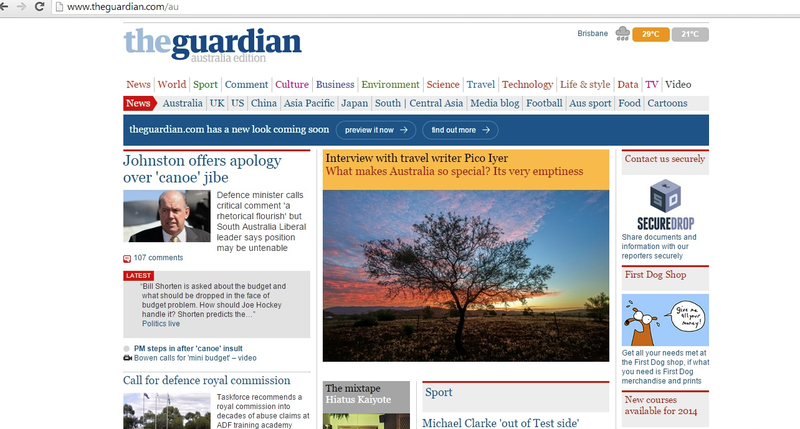 The Guardian’s new look and feel will take people out of their comfort zone and likely elicit some sort of response but McClelland says they are ready for it. “Everyone fears change and I don’t think there’s any way launching a product without some of your audience being dissatisfied. There’s always a contingent of people who are unhappy. What it really is, is it’s unfamiliar,” he says. 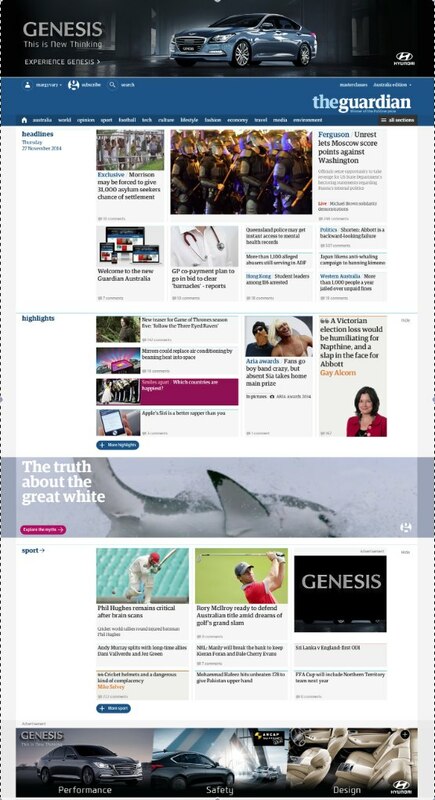 The US version of The Guardian has already launched and the UK makeover will go live early next year.